thank you so much, each and every one of you, for your comments and emails about my last post. i really do feel a lot better hearing all of your experiences - it just isn't commonly talked about, how long this can really take. i had no idea, really, when we started. i spent so many years trying NOT to get pregnant, i guess i was conditioned to think that as soon as there was no protection involved, a baby would result! thanks to a lot of thinking and your kind words i'm really feeling a lot more chilled out about the whole thing. i'd also had it in my head that i wanted to leave work at christmas and not have to go back and so have been putting a fair amount of pressure on us for the last few months. now that that "deadline" has passed and i've got a few crafty things brewing, i think we can relax and let nature take it's course (in saying that, now that i've spilled the beans, you can expect a melodramatic rant when i get my period this month). 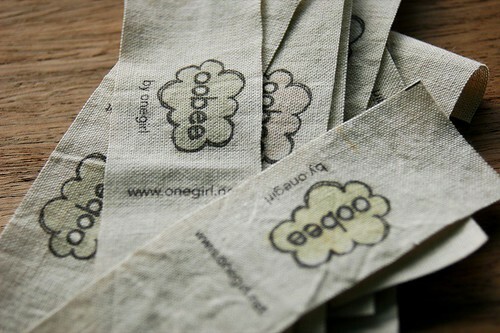 Those tags are really nice - I like the texture and natural quality of them. oh, good luck with the baby! hope things work out for you really soon. Ooohhh! I love your tags. You will have to give me some tips, mine frayed on the edges and ended up having a backing ironed on.